Due to the lack of coordination, it is unlikely that the selfish players of a strategic game reach a socially good state. Using Stackelberg strategies is a popular way to improve the system’s performance. Stackelberg strategies consist of controlling the action of a fraction α of the players. However compelling an agent can be costly, unpopular or just hard to implement. It is then natural to ask for the least costly way to reach a desired state. 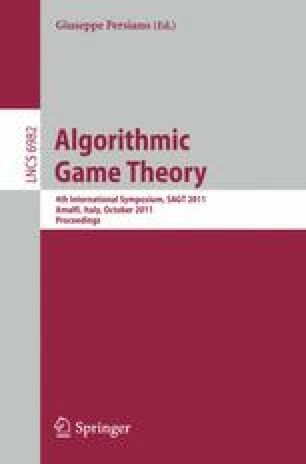 This paper deals with a simple strategic game which has a high price of anarchy: the nodes of a simple graph are independent agents who try to form pairs. We analyse the optimization problem where the action of a minimum number of players shall be fixed and any possible equilibrium of the modified game must be a social optimum (a maximum matching). For this problem, deciding whether a solution is feasible or not is not straitforward, but we prove that it can be done in polynomial time. In addition the problem is shown to be APX-hard, since its restriction to graphs admitting a vertex cover is equivalent, from the approximability point of view, to vertex cover in general graphs. This work is supported by ANR, project COCA, ANR-09-JCJC-0066.